Click on the Take Action button to urge your U.S. Rep. if he has not already done so, to cosponsor the Richard Hudson reciprocity bill (H.R. 38). 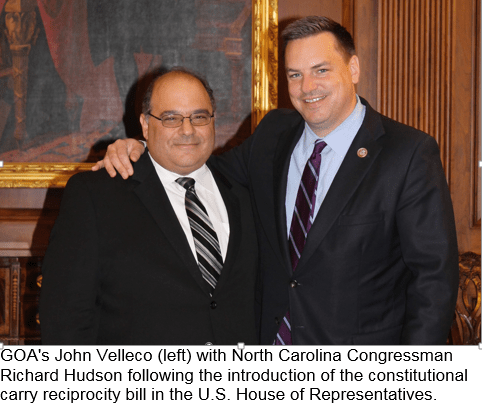 On January 3, Congressman Richard Hudson (R-NC) introduced legislation, H.R. 38 to grant national reciprocity for Americans who can carry concealed firearms in their home states. After years of discussion and negotiation, Hudson’s new bill, H.R. 38, unifies the major components of the Second Amendment community and has the strong support of Gun Owners of America. The Richard Hudson bill would ensure that victims of crime like Pennsylvania concealed carry holder Shaneen Allen do not face decades of imprisonment merely because they traveled into another state. It would cut through the labyrinth in which 50 different sets of rules create an incomprehensible jumble which even lawyers cannot understand. We are constantly hearing from law-abiding Americans who want to drive from Florida to northern New England — and are confronted by up to 15 different sets of state laws. You can cross a state line in an instant — frequently without warning. And not being able to distinguish between the laws of New Hampshire, New Jersey, and New York may mean the difference between lawful conduct and a twenty-year prison sentence. The Hudson bill also benefits citizens of anti-gun states who get permits from pro-gun states. 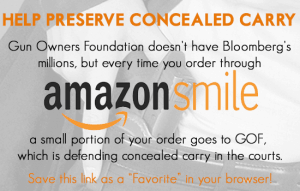 So if a gun owner living in “occupied” California, New Jersey, or New York gets a carry permit from Utah, then he or she will be able to carry a firearm in any state in the country! For all the above reasons, the Richard Hudson reciprocity bill would make America safe again — by allowing Americans to exercise their God-given right to protect themselves, their families, and their communities. There are countless examples of people who have used their firearms in self-defense when they were away from home. Make no mistake about it, this bill will save many lives. ACTION: Urge your U.S. Rep. if he has not already done so, to cosponsor the Hudson reciprocity bill.